Many battles have been won by outnumbering the opponents, by using new weaponry, using geographic advantages – even weather ones – but many will agree with me that likely the most valuable element for a victory is: the surprise. Recently, whilst working on my own writing, I’ve been researching widely on the Nazi invasion of Crete, during the WWII. To the day, many historians, war specialist and aficionados debate about the merits from the German army and the right or wrongdoings of the Allies in the island. However, nobody will ever argue that one decisive factor for the victory was, precisely, the surprising element of the airborne invasion. The first in the history of warfare. But those were other times with other technology and resources. Today, war is a completely different concept where, whilst the human resources remain as the main source, high-end technology, informatics, ultra-advanced espionage and telecommunications have become the critical support for operations at any scale. Having said this, let’s imagine a scenario where your most powerful weapon would not be a nuclear warhead, a biochemical agent or a state-of-the-art air fighter; what if the most effective ever resource would be the brilliant mind of an individual who, by the way, would never want to harm anyone? Frederick Forsyth returns to tell us a story where he won’t skimp on details about the black ops, the espionage networks, the political decisions taken behind doors, the diplomatic relations and the individual stories of all the characters involved. Could a government be able to sabotage operations and premises around the world without even put a foot on those targeted territories? How to cover any trace? What would it take to protect your secret weapon? If you are a follower, big fan or just discovered Frederick Forsyth, probably by reading The Afghan, Cobra or The Odessa File –just to mention some of Forsyth’s master pieces -; don’t dare to miss ‘The Fox’. A novel with a plot developed in current times and with lots of accurate descriptions of international conflicts and events that – frame my words – will make you see the world with different eyes on every turn of page. I am unable to describe further about the plot without giving up details that are reserved for the avid reader. 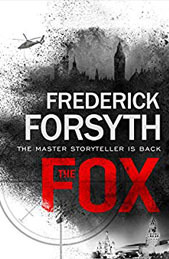 But I won’t stop myself from telling everyone that ‘The Fox’ has reached a place among the top five of my books where Forsyth already holds the first place as well. For all those readers who enjoy with military operations, international politics, even for those Conspiracy Theorists, this book will not disappoint you and, if by fluke this novel is your first encounter with Frederick Forsyth, well… I promise there’s not point of return.